Bernie's biggest fans are ready to get down with the Green Party. Will it make a difference? With Hillary Clinton now the presumptive Democratic nominee and a fresh wave of truly superdelegate endorsements rolling in—including President Obama and also progressive favorite Sen. Elizabeth Warren—Bernie Sanders' backers, who have been some of the most engaged and passionate participants of this campaign cycle, are faced with a decision they’d hoped to avoid. As far as lifelines, there are two main options. There's the Libertarian Party and its charismatic candidate, former governor of New Mexico, Gary Johnson. One recent Fox News poll shows the party polling at 12% nationally. That’s approaching the 15% needed to qualify for the presidential debates. And there's the Green Party. While the Libertarian Party has been garnering coverage as a "Never Trump" alternative, the Green Party has a harder time getting mainstream media attention when the subject matter isn’t Ralph Nader, the iconoclastic political activist who led the party in 1996 and 2000, and who sometimes gets partially blamed for Al Gore’s failure to win enough electoral votes in the 2000 presidential election. Dr. Jill Stein, a former physician and Green Party presidential nominee in 2012, is again the leading candidate to be the Green Party’s nominee this time around, having won 20 of the 21 contests going into the party’s national convention in Houston in August. With strong indications that Sanders may soon step aside for Clinton, Stein is pushing the message hard that the Green Party can carry the torch for those feeling the Bern. While Sanders has promised not to run outside of the Democratic party, his followers are free to do as they like. And I wanted to know what they liked. Were they interested in this party known for prioritizing environmentalism? What about a party that pushes for progressive positions across the board, including slashing military spending and cracking down hard on Wall Street? The Green Party platform, it seems, echoes the priorities of Sanders’ supporters in many ways. With these questions in mind I turned to social media, which did not disappoint. Minutes after soliciting feedback on Twitter, I was contacted by Sean Curtis, a 26-year-old, self-described “classic Bernie Bro” who works at a production company in Los Angeles. Curtis said that he’ll be voting for Stein and the Green Party, which he also supported in 2008, because Democrats failed to realize Sanders is the stronger candidate. Curtis politely apologized for any ranting he may have been doing, and his views are admittedly far left of the mainstream (he didn’t vote in 2012 because he doesn't feel that Obama is anything more than an establishment Democrat). However, his response to the huge question of possibly contributing to Donald Trump’s election by not voting for Clinton was reflective of other responses I received. As for the problem of Trump, he said of course Clinton would be preferable, but that’s not enough to necessarily earn his vote. Come November though, if his conscience tells him to vote for Clinton to prevent Trump from winning a close race, he’s open to that. He’s also considering not voting at all. But right now he’s likely to vote for the Green Party and environmental issues are a big part of that reasoning. This includes transitioning to 100% clean renewable energy by 2030, and investing heavily in things like public transit, sustainable agriculture, and conservation. While the implementation scale and timeline of these ideas is highly ambitious, there's nothing exceptionally revolutionary about them. That's the thing about climate change: We have the resources to act now, all that's required is the will. 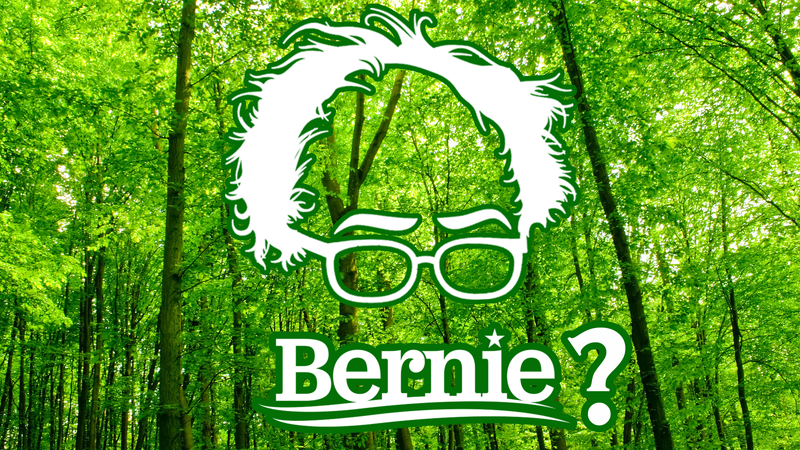 I posed the same question I’d asked on Twitter and Facebook—are Bernie supporters considering pivoting to the Green Party?—on a Reddit thread in the environment subreddit. The conversation mostly steered back to the question of whether risking a Trump presidency is worth it. "If the vast majority of voters continue to vote for the lesser of two evils, then that will be our only choice in perpetuity." Several people noted how if you’re in a deep blue state that will already be going to Clinton, or a deep red state where she has no chance, then voting for a third-party candidate like Stein makes more sense for those conflicted by the Trump conundrum. However, this still smacks of the type of pragmatism that people like Curtis, Saucedo-McQuade, and Galvana side-eye with heavy skepticism. Thereisaway said she’ll be voting for Stein because Trump and Clinton are both deniers. Stein agrees with the notion that Clinton and Trump are similar in more ways than people often perceive. So I’d say, don’t be a victim of this propaganda campaign, which is being waged by people who exercise selective amnesia. They’re very quick to tell you about the terrible things that the Republicans did, but they’re very quick to forget the equally terrible things that have happened under a Democratic White House, with two Democratic houses of Congress. It’s time to forget the lesser evil, stand up and fight for the greater good. We are the ones we’ve been waiting for.